Ten thousand visitors took to the country to Castle Ward, a National Trust property near where I live, on Easter Monday and Tuesday. There were two ferries operating between Strangford and Portaferry to cope with the traffic. I often wandered why there was an ice cream shop in Strangford. Now I realise it is there to provide for the children who are waiting for the next ferry. My own grandchildren had the extra delight of getting ice cream slushies as they waited for the ferry. Delicious. In an article in a Belfast newspaper there is a story about an one arm teddy bear that got left behind at Castle Ward. Some little child would be missing his cuddly toy that night. I hope teddy and child will be reunited. Over the past week some of my own children and grandchildren came to visit to celebrate Easter and my fifth year anniversary free from cancer. Bedrooms were overflowing with people, like the luggage hanging out of suitcases. I had to make sure there was plenty of hot water for all the showers going. Hair dryers were buzzing. The fridges were full, the range at full heat, logs were gathered in, plenty of supply of toilet roll and tissue, the boiler timed for heat and hot water, and the dishwasher was spinning. The kitchen was full of activity as meals were prepared and ate. For a few nights it was like the old days when we would gather around the fire with Brendan telling stories, then prayers and bedtime, for old and young. In the mornings I heard voices from the bedrooms. Sisters were talking and laughing as they caught up with each other’s news. Three of them did a workout in the morning sun. Four children were tempted to take a swim in lough below. In the afternoon some collapsed on the lawn with heads together chatting and enjoying the warmth of the sun. One of my girls had the flu when she returned. With love, rest and prayer she recovered and headed off to Kenya for work on Tuesday. Some of my grandchildren had tummy upsets and chills. One of them went to the doctor. He could find no infection. Praise The Lord it was a demonstration of God healing her. She had a smile on her face when she returned. Mum and child had no need to worry. Grand Da’s home is a place of refuge and healing from the storms of life. All the grandchildren left today. The house is silent. The fridges are empty, only ashes in the fireplace, the dishwasher and hair dryers are quiet. The bin is full of empty Easter egg packages and drink bottles. Bedcovers are tossled on empty beds. Damp towels are left on the floors. I had a relaxing bath and went to bed early trying to cope with the emotion of it all. I awoke in the middle of the night to get a cup of tea. Brendan joined me. We are together again, just the two of us. A children’s I Pad, some Easter eggs and vases of colorful tulips are left behind. 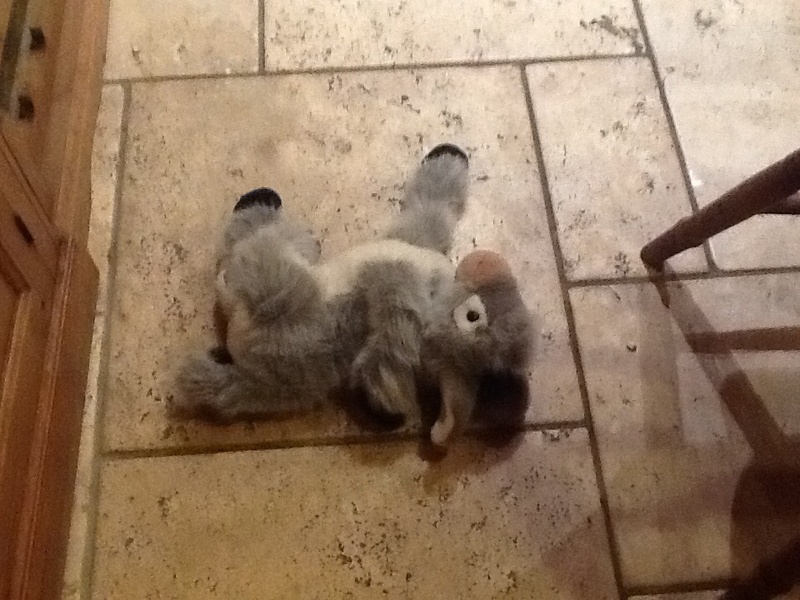 On the floor a toy donkey was lying with its leg over his head. Perhaps it was wiping away his tears at missing the children. 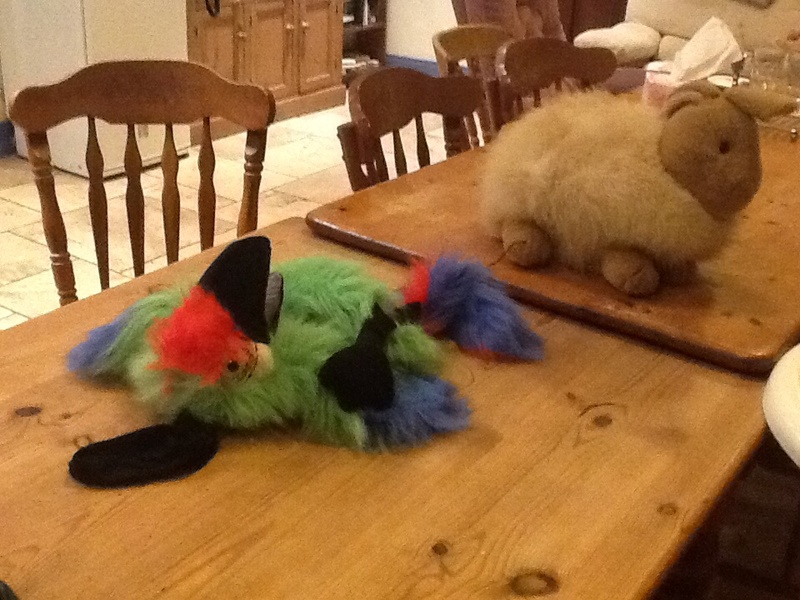 A toy bird lay on the table. There was no more screaming laughter from Grand Da’s antics with the puppet bird. A bunny rabbit sat forlorn with a toenail broken. I can understand where the inspiration for Toy Story came from. But I have lots of love and memories in our hearts. And I have clean carpets and a new Hoover. My daughter could see the dust. The dust and the grandchildren have gone. They will return. Ah Ma. That’s lovely, sure they’ll be back before you know it! Thanks Nora. And thank you for sharing a little of your expertise while you were here. Do it again Lord.